A fully lined balloon valance on a curtain rod is a nonmoving treatment that looks complicated and fancy (when made with an ornate fabric, it harkens back to Victorian style), but it’s simple to create. This project resembles its name: It consists of three puffy balloon shapes side by side, separated by two vertically shirred areas that create the balloon effect. Try a lightweight cotton, a beautiful chintz or taffeta, or even lace. However, stay away from fabric that’s too heavy because you won’t be able to create the balloon effect, and too-soft fabric with too much drape won’t retain the balloon shape. 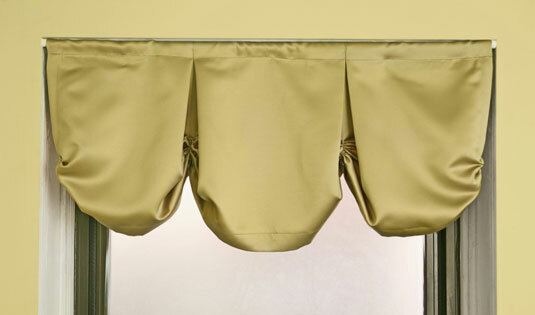 Balloon valances also employ a fabric lining. When deciding on a fabric for the lining, consider a contrasting decorator fabric in a weight similar to the “front” fabric. You can pick up the small part of the lining that peeks out into your room in your room design, and this treatment looks equally lovely from the outside of the house. If you don’t want to match two prints, you can use a classic lining fabric, such as ivory sateen. This project calls for shirring, which is a way of getting a scrunched-up effect by manipulating the fabric into rough-formed gathers. You move the fabric into a smaller area by weaving a safety pin in and out of the fabric (think of the way a worm would eat through a tasty green leaf!) to keep it held in place. In this instance, you shirr the fabric and hold it fast with a safety pin to create tiny pleats. Measure across your window to where you intend to mount your hardware for your width, and double it. Determine how long you want your valance to be. When determining length, consider your window’s proportion. If it’s a very large and/or long window, go for a full one-third measurement for your length and add 7 or 8 inches, to allow for the 2 inches of fabric that turns over to the back to create the rod sleeve, and for the 5 or 6 inches fabric that will be shirred upward into the safety pins. Place your fabric and lining face-to-face on your worktable, and then stitch them together 1/2 inch in from the edges, all the way around the fabric, leaving a 4-inch opening at the center top of the valance. After you’re done sewing, pull the fabric out through the hole so the fabric is right side out; iron flat. No need to close up the 4-inch opening now; you stitch it shut later in this project when you create the rod sleeve. Using your straight pins, pin your lined fabric into pleats. Keep your three sections of equal dimension. Fold under the fabric at each side 2-1/2 inches to create a hem, and pin. Press the pleats from top to bottom with your iron and, at each side hem and on each side of each pleat, stitch 4 inches down from the top. You can do this step on your machine or by hand. Now fold the top of your pleated panel over and down 2 inches, so the fabric is folded toward the back, and stitch across, which will create your rod sleeve. Prepare to shirr the fabric by flipping over the valance so that you’re working on the back. Locate the center of each pleat by checking on the front of the valance. Starting an inch from the bottom, measure 5 or 6 inches up — this spot is where you shirr. Gather 5 or 6 inches of fabric into the safety pin, pushing the pin in and out through the fabric. If you like the effect, shirr through the outside side hems, as well. Your fabric now fits into the 2-inch safety pin, which creates the scrunchy gathers. Insert your curtain rod through the rod sleeve of your choice and hang your valance.